It always amazes me how quickly I adapt to Pacific time! I woke up at 11am EST on Friday. Friday was dedicated to race prep and course orientation, I mean, what else would I have done, gone to the flower fields of Carlsbad? Because I had to stop…and smell…you know. Back to race prep. I ran an easy 20 minutes in 60-ish degrees with the most lovely ocean breeze. I biked around the course willy nilly before finally locating the transition area 3/4 miles north of the finish and checkin area, so I didn’t pre-ride much of the actual bike course except for the transition area, which is typically the most technical and easiest place to make mistakes anyway. The run course was as flat as I expected with the exception of 2 very steep and short ramps between the concrete “Strand” along the ocean and the road parallel to it. 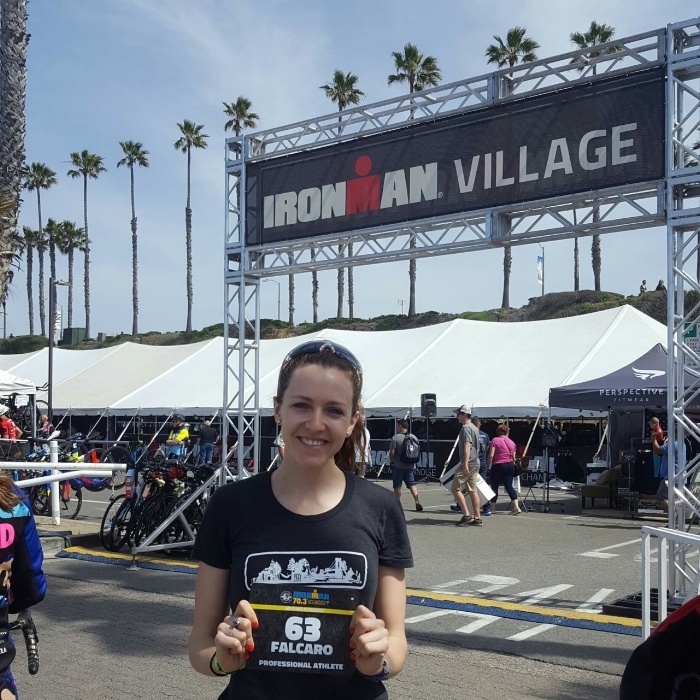 I got my first taste of the pro treatment – after I accidentally waited in the general waiver line and was assigned an index card indicating I was bib #2622 – when I approached the pro athlete registration table and almost got rejected as I carried my 4-digit bib number indicator up to it. 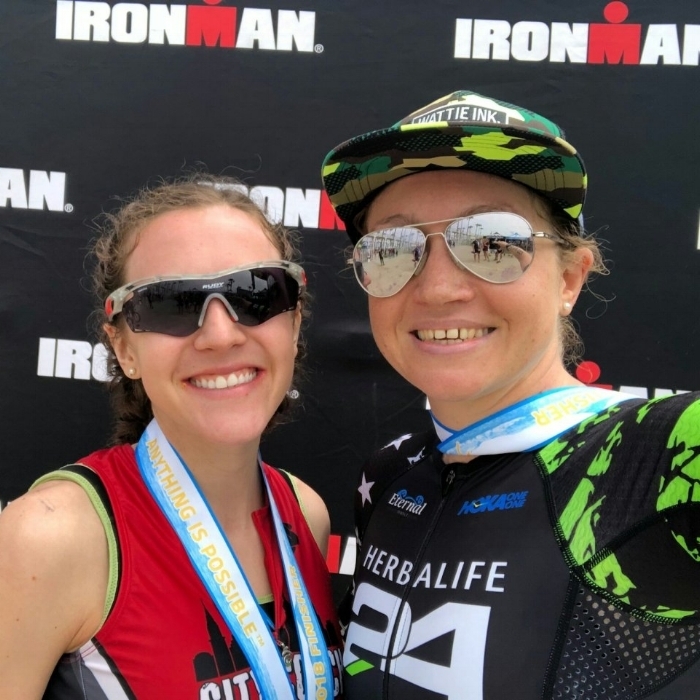 I clarified that I was racing pro, because nothing like declaring it out loud and getting over the imposter syndrome I expressed in my last post. After taking care of race prep and despite this being a “business trip” (I traveled solo and was there for a mere 44 hours!) I checked out the Flower Fields in Carlsbad (hat tip to a local, Eric, for the rec!). I had never been to Southern California before, and I was there in the short window these flowers are in bloom. Traipsing through them was like walking through a dream. I felt like Dorothy in the field of poppies, except I wasn’t being followed around by three strange men (at least, not that I’m aware of.) It was a great way to escape the hubbub of the race area, which can be draining, and have lunch with iced coffee. I returned to the hubbub (I love this word!) at 4pm for the pro athlete meeting, which was a hullabaloo! It was far more entertaining than expected, with honest expressions of the sternum rule and concerns about the speed zone. The speed zone was a 1/4 mile long downhill segment around mile 39 of the bike on which pros couldn’t exceed 35 mph (25 mph for the amateurs). The zone speed limit was being enforced by sensors and clocks, and you wouldn’t know until the end of the race if you were DQd for exceeding the speed limit! Personally, I think a speeding ticket would be a great revenue generator for the race! During the meeting, we also discussed the last-minute change from the ocean swim course to the harbor swim course due to expected intense swells. While I do well in rough conditions, it was probably the only time I’d benefit from swelling 😀 And yes, it was really, really cool to have so much talent in one room at the meeting. It was probably the least amount of oxygen used in a meeting of 65 people. I signed my intent to race on the board! After the meeting, I watched the IronKids race on The Strand, had dinner, and unpacked and repacked my bags one more time. I woke up at 4:45am to eat a sad west coast bagel with honey almond butter and a banana. I drove to the race, parked, and set up transition. I put on my wetsuit just in time for our 6:20am warmup in the 60 degree water. I was the very FIRST person to go in! It was the first time I’ve ever associated “swimming” with “being first.” Whoever assigned the pro men gray caps deserves two slaps to the goggle, because that’s exactly what I got during the swim warmup when returning to get a second cap. The water was 60 degrees, so why I didn’t originally think I’d need a second cap beguiles me. I was generally uncomfortable during the bike, and not in a “so many watts oh the power!” way. I kept fussing with my braids, my watch, and posture. I milked each of the 7 (yes, 7!) gels I had, savoring it for the entertainment it provided, like communion at mass. (This post is 10x more religious than I am.) It was evident that I spent most of winter on my road bike for long trainer rides instead of on my tri bike in aero. Setting off for a flat run, I was like a student on the last day of class. I started with a 6:24 mile and felt really good, an indicator I hadn’t biked hard enough. I settled in and kept plugging away low 6:40 miles and realized at mile 5 that I should take a gel and some salt when my right quad started feeling like a dense mass of lead and not a properly contracting muscle. I felt better in just a few minutes once the gel kicked in. About a mile later, I heard my name coming from another athlete approaching me – the course was 2 loops on mostly the same streets so it was more like two out-and-backs – it was Lucy! She gave me the hardest high five, but more like a mid five at our waists, so as not to interrupt the arm carriage. It pumped me up so much! At mile 7, I stopped for a 10-15 second hamstring stretch and again felt instantly better. That mile was my slowest at 6:57, but it was 100% worth it to gain some range of motion and a smoother stride. I saw Lucy (and Anthony!) three more times on the course. 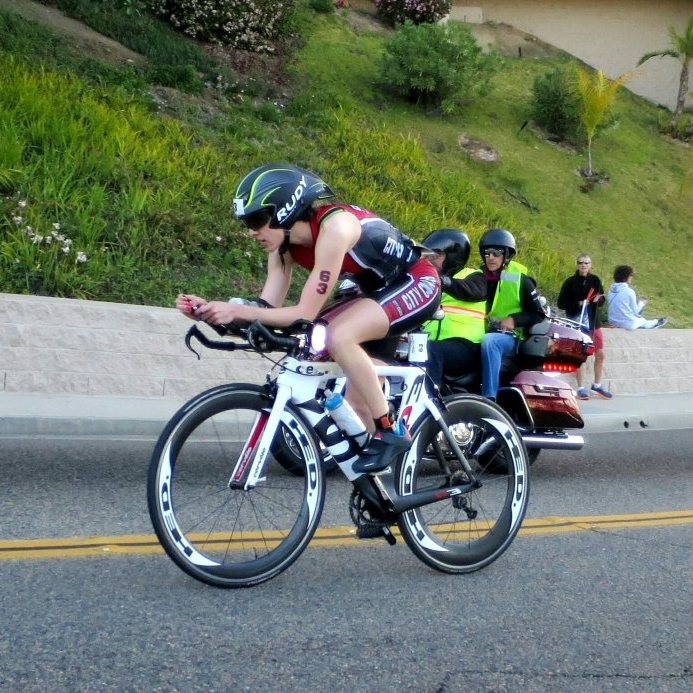 I also saw Heather Jackson, Jan Frodeno, and Jesse Thomas on their second lap while I was on my first. Jan is as tall and lean in real life as you’d expect. Kind of like Gumby, but if Gumby were a bodybuilder. Yes, a bulked-bulked out Gumby, Jan is. I took another gel at mile 8 and my last of 4 salt tablets. I noticed that I felt better each time I took a gel, so I took one more at mile 10, figuring it was my last chance to take in some calories and benefit from them. For those counting at home, that was my 10th gel! My stomach had no issues – don’t be gelous. I took an ounce of water and/or Gatorade at every aid station, which was about each mile. I don’t love that my nutrition plan is very ad hoc on the run, but I am also learning how to read and understand the needs of my body. It was only my 3rd full 70.3, after all! We were so lucky with an overcast day, so despite NYC still having snow on the ground and my last run being in 38 degrees, 65 degrees didn’t feel that bad. I still poured water on my head and didn’t mistake coke for it (as I’d done in my first 70.3) every chance I got. Aside from 1 2%, half mile incline each loop, the only other non-flat parts were 2 ramps per loop, steep enough that it felt better to go up them than down. At 11 miles, I knew I was going to clock a really solid half marathon time with an average pace well below 6:50. I couldn’t identify any pros during the run, but it turns out I had passed 4 and moved into 14th. I made an impromptu goal (always good to change your goals like you change your hair) to run the final two miles in 6:40-something, and I ran 6:46 And 6:42. I finished with a 1:27:32 for an average pace of 6:41 and a total time of 4:48:45 for 14th female pro of 22. Lucy says this is a “cheeky” photo of us. She is my favorite Brit! I got into some Normatec boots and found Lucy. We took our own private shuttle to collect allllll our stuff at transition. I went to my rental car drove to the In N Out Burger closest to the airport before my 4:45pm flight. I’m just going to say it: In N Out is a wee bit overrated, but it’s more or less a requirement for us east-coasters to visit. I’m proud of my pro debut. It was a solid race, with a good swim, an ok bike, and a great run. I’ll be spending more time in the saddle in aero until my next race, a 70.3 at Wildflower on May 5 with race wife Cecilia! Thanks Tribike Transport for getting my bike there safely and for this cheesy picture!